Courtesy of RE/MAX Alliance-Greeley, John DeWitt. READY NOW!!! The Remington is a 3 bedroom, 2 bath, ranch home with an open floor plan. Features include slab granite countertops, full tile backsplash, 42 upper cabinets with crown molding, beautiful wood floors, and full tile shower in the master bath. Home also features a full unfinished basement and an oversized 3 car garage with 8′ doors. Front yard landscaping included. Pool coming in 2019! Ask about our $5000 Builder Incentive! Driving directions: I25 to Wellington exit. West through town to Hwy 1. South to GW Bush Ave. East to Sage Meadows. 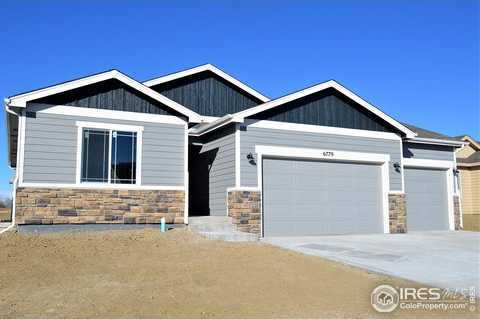 Please, send me more information on this property: MLS# 858118 – $363,495 – 6779 Sage Meadows Dr, Wellington, CO 80549. I would like to schedule a showing appointment for this property: MLS# 858118 – $363,495 – 6779 Sage Meadows Dr, Wellington, CO 80549.